Brand name : IK PLUS Paper Size : 210mm x 297 mm (International A4 size) ( 215mm x 279mm ) Substance : 70g / m2 Brightness : 102-104% Quality : 100% Virgin Wood Pulp Whiteness : CIE 167 Thickness : 110 um Opacity : 95% Roughness : 140 ml/min? PACKING DETAILS 500 SHEETS PER REAM. 5 REAMS PER BOX. 1560 BOXES 1x20 FT CONTAINER (WITH PALLET). 1600 BOXES PER CONTAINER (WITHOUT PALLET). 7800 REAMS TOTAL IN ONE 20FCL (WITH PALLET). 8000 REAMS TOTAL IN ONE 20FCL (WITHOUT PALLET).????? 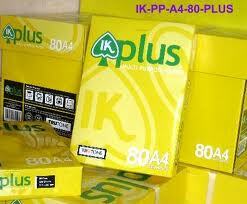 IK PLUS A4 PAPER 70GSM Copy Paper by Radja Printer at Pakbiz.com a premier Business to Business marketplace and largest online business directory. Find IK PLUS A4 PAPER 70GSM Copy Paper from Indonesia complete basis & contact information, business offers, availability & related Office & School Supplies products. This page gives you information about the authentic sellers of this product. It allows buyers and sellers communication directly. It can also facilitate the buyers to purchase the product in reasonable prices.